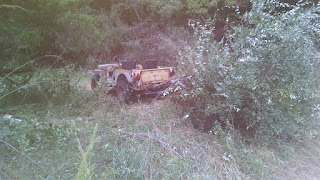 We got started in all of this with the idea of having an old jeep to use for chores around the farm. Although no longer a working farm, Mother Nature is always at work trying to reclaim open fields and forest trails. For the past 6 months, Barry has been engaged in a battle with an invasive tree (autumn olive) and the old rusty, trusty CJ2a has been a critical weapon. Every day, weather permitting, Barry heads to the barn where Yeller lives and fires up the jeep. It is already loaded with a variety of gas and manual tools (saws, pruning shears). Then off to pick up a little trailer for hauling the trees and brush to the burn pile. In the photo above, taken in the early morning, the little red trailer is full and overflowing. The ’47, with its faded paint and rusty body just keeps running. One morning, Barry noticed that one of the trailer tires was low. It was then that he realized that he hadn’t put air in the 2a’s tires in the past decade. With Thanksgiving just ahead, the focus on chores will shift to trips into the wood to hauling firewood. No matter the season or job involved. Ole Yeller is the true farm jeep. 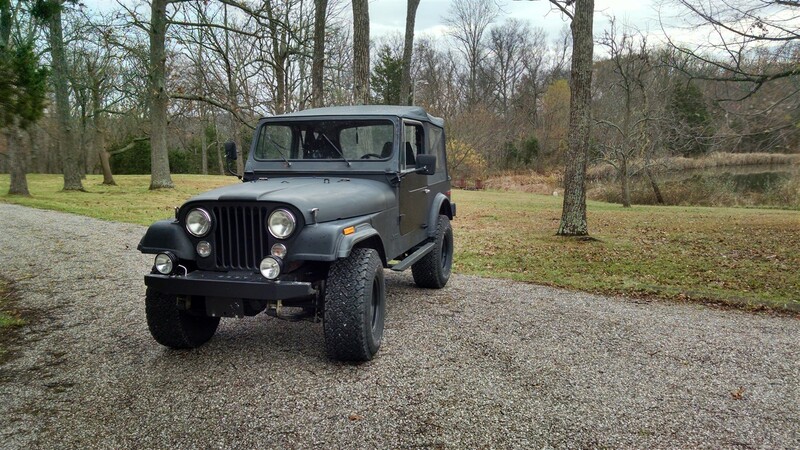 For the past 30 years, Barry has had a CJ5 or CJ7 as his daily driver/fun jeep. The 1979 CJ7 Golden Eagle has been in semi-retirement for several years, awaiting a restoration. This winter was to be the start of that restoration but plans have changed. Instead, we decided to acquire a CJ7 that doesn’t need extensive restoration and to spend our energies and dollars on the ’47 and ’49 jeeps. So it was another JRT (jeep retrieval trip), this time to Columbus, OH. The seller owns a couple of auto repair shops and had acquired a 1977 CJ7 from a client who no longer wanted it. He was looking for a “fun” jeep to drive around. Over the past couple of years, he repaired and replaced about every component. The body is in great shape. It has a flat black paint job and has been dubbed “Matte” (a working name) . While we don’t know Matte’s full history, it should feel at home here. Before his makeover, Matte had lived and worked on a farm. The Golden Eagle is a special jeep and we are hoping to find a new home where it will get the full attention and restoration it needs. 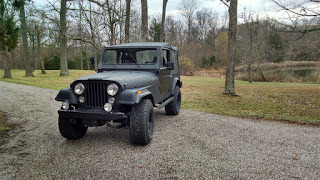 The new CJ7 will take up duty as the “winter emergency” vehicle and a working member of the Farm Jeep family. Update – While preparing the Golden Eagle to sale, Barry realized that he just couldn’t do it. So Matte found a new home and the Golden Eagle will become a new project.